Before a crowd of thousands of Poso residents in late 2009, roughly three years after Christian-Muslim violence in the region had ended, Poso district head Piet Inkiriwang extolled the virtues of investment. ‘If investors come to Poso, we will all shower in money,’ he told the crowd. ‘You’ll have bucketloads.’ These buckets of money were to come from new jobs and compensation payments for land that investors would need. Economic development is essential to rebuild Poso. But investment does not automatically lead to recovery. All over Indonesia, district heads compete to bring in new investment to their regions. Too often, a pattern of development results in which the government and large companies collude to maximise profits or for personal gain. Meanwhile, communities often have little choice but to accept unfavourable deals in the face of intimidation or to satisfy pressing short-term economic needs. A major test-case for the benefits of investment in Poso has been the massive Sulewana hydroelectricity project. Agreed to in 2005, the project is a $650 million investment by former vice president Jusuf Kalla’s Bukaka group. Three hydropower stations on the upper reaches of the Poso River will generate around 700 megawatts when complete, making it one of the largest hydroelectricity schemes in Indonesia. The project has polarised public opinion. On the one hand, it has brought new money and jobs to populations near the project and raised hopes that the electricity crisis in Central Sulawesi will be alleviated. At the same time, those living near transmission lines are concerned about the plant’s long-term impact on health or about how they will earn a living after selling their land to the project. Others doubt the plant will help meet local energy needs, citing plans to transmit much of the electricity generated to industrial customers in South and Southeast Sulawesi. One location where opposition to the project has come to a head is Peura, a majority-Christian fishing and farming village on the eastern shores of Lake Poso. The controversy in Peura concerns the location of transmission towers for high-voltage overhead power lines. Initially, the community believed that the twenty-one towers to be constructed in Peura would run along mountain ridges, avoiding residential settlements. But it turned out that the company planned to site two of the towers in densely populated areas. Problems in the village began as community members strove to have their concerns over these two towers heard by the company, the district government and the local parliament. The construction of the transmission towers has brought an influx of new opportunities and compensation to Peura’s conflict-affected economy. The most lucrative option is to become a sub-contractor – an opportunity open to only the most influential members of the community. The first person in Peura to become a sub-contractor was the village head. He was followed by an ex-soldier and a respected local figure. Senior community members have become security guards or foremen and a few high-school graduates have been employed as field technicians. Women and young people, including several children, became construction labourers, hauling rocks and sand, working on short-term contracts. For this work they receive around $4 per day. Several community members are very happy to have gained employment and become part of such a large development project, even if for a limited time, claiming that they were satisfied with making enough money to cover their expenses. Those entitled to compensation payments for land have received more money. Many landowners were willing to sell their land to pay for education and health, or just to make ends meet. Outside the populated areas of Peura, landowners have typically received between Rp. 1 million and Rp. 8 million for their land. One lucky homeowner negotiated a payment of Rp. 250 million to sell their house for a tower near the port. But it was not easy for Peura villagers to obtain a fair price. Many families explained that they were offered rates below market value and that prices varied depending on how hard they negotiated. Government officials and security force members often took part in land negotiations, landowners said, making appeals for ‘development for the greater good’ to push villagers into selling. The science on the health impacts of electromagnetic fields from overhead power lines is inconclusive. The World Health Organisation in 2007 concluded ‘that current evidence does not confirm the existence of any health consequences from exposure to low level electromagnetic fields’, but also acknowledged gaps in the available scientific literature. Some studies have indicated an increased risk of childhood leukaemia – the WHO concluded that available evidence fell short of establishing a causal link, but provided sufficient grounds for concern. Its recommendations are for very-low cost precautionary procedures to reduce exposure and further research to reduce uncertainty. PT Poso Energy was required to undertake a mandatory environmental impact assessment, which gave the company an opportunity to engage with these concerns. It could have explained the possible health impacts of proximity to high-voltage power lines, set out what measures it proposed to take to mitigate any risks, and given villagers an opportunity to respond. But although the company did conduct the required assessment, villagers say that it has never explained this process or consulted with the community. Instead, the company drove through the project with support from the government and the security forces. Where co-optation has failed, supporters of the company have used intimidation tactics. Eighteen villagers have been charged, mostly for disturbing public order, a misdemeanour charge which carries a maximum fine of only fifteen cents. One man though received a four month sentence for threatening behaviour. PT Poso Energy also engaged a well-known figure, Robertus Tibo, as a sub-contractor. Tibo gained prominence during a local campaign to free his father, Fabianus Tibo, who was convicted of involvement in the Poso conflict and was executed in 2006. Tibo employed several ‘ex-combatants’ to oversee the construction process and intimidate community members. Opponents of the towers in Peura have engaged in all manner of protests to have them moved away from residential areas. For the past five years they have sent off letters to the company and to the government and parliaments at various levels, held meetings and dialogues with each of these bodies, and approached the church for help. They have tried peaceful protests and staged sit-ins in the path of trucks carrying materials for the towers. In the process, protestors have faced violence and intimidation from the security forces. 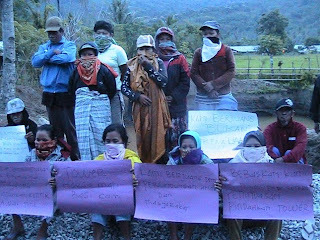 In March 2011, opponents of the towers, many of them women, sat on the road in an attempt to block further construction, demanding that PT Poso Energy to explain the details of the environmental impact assessment and demonstrate that they had permission to build the towers in residential areas. Dozens of security force members broke up the blockade by force, dragging women off the road. The local government has repeatedly sided with PT Poso Energy, which has repeatedly stated that it would be impossible to move the towers, not on the basis of detailed evidence that there will be no health impacts, but because it would be too expensive. Having exhausted other avenues, opponents of the towers even sought an audience with Jusuf Kalla himself. Kalla agreed to meet with a small delegation of Peura villagers in March at the offices of PT Poso Energy. Local security force commanders were present and NGO activists were prevented from attending. Security force members outnumbered the villagers at the meeting. In this hydropower and other investment projects, communities in Poso are losing their land and future livelihoods in the name of regional economic growth and development. When communities oppose these projects, the police, local government and the military side with the investors. In the case of Peura, this strategy backfired when some previous supporters of the project launched strike action in June 2011, opposing any further work on the towers until the company delivers on its promises to contribute to public facilities. If investment is to benefit community recovery, the Poso government needs to change tack and work more closely with communities to involve them in development. Rather than intimidating residents with development slogans and trauma from the preceding violent conflict, the government should ensure that they have access to information about planned projects and that resource investments provide genuine economic opportunities for the community. Otherwise, the government risks investment becoming a new field of conflict, compounding the enduring social and economic effects of past violence. Lian Gogali (lian.gogali@gmail.com) lives in Tentena and is the director of the Poso MOSINTUWU Institute, as well as an independent researcher and freelance writer. She has been actively involved in Peura community advocacy to move the hydroelectricity transmission towers outside of residential areas.